Creative Industries Exchange - Applications Are Open! Curren$y has dropped 5 albums this year. What are you doing with your life? Want to kick it with Wu-Tang for 2-Days in Atlanta? J.I.D's XXL Freshman Freestyle goes IN!!! Royce da 5'9" speaks on his new album, "Book of Ryan"
TED Talk with Malika Whitley "How The Arts Help Homeless Youth Heal and Build"
Listen up: Atlanta's Drako & Yung Bans drop collab "BOSS"
"A3C music festival and conference was one for the books"
A3C has partnered with Atlanta's New Streaming Platform "THEA"
My Experience at the Creator Complex by Hickman L.A.
Fool's Gold DAY OFF ATL: DJ Drama and Don Cannon Bring Out Playboi Carti! The Final day of #A3C17... NAS!!!! Need a Lyft to A3C? We got you! The Combat Jack Show: Live At A3C! A3C #ThisIsMyYear Artist Amerika Addiction Releases New Video for "Great Night "
Curator Spotlight: Bhrama Bull "GRYNDFEST IV"
Battle Rappers, are you ready? Discover some Dope Indie Hip-Hop artists on the Come up! The A3C App is now LIVE! The [iStandard] Trakhouse Schedule Is Complete.. and it's LIT! F#@k it, we'll do it LIVE! "No Jumper" Podcast Interviews A-Trak LIVE at A3C! LANDR Interview: You Don’t Need A Studio To Produce Tracks For Drake! Want to See Young Dolph at A3C for 50% Off? A3C '17 Artist Ché Releases a New Visual for "LEAF"
New Music: Saba, "There You Go"
The A3C Conference schedule is LIVE! Wanna open for YFN Lucci at the T.I.G. 5 Year Anniversary Show at A3C? The Future of Mixtape Hosting: Does it have a place in Hip-Hop? ICYMI: Kirk Knight Join Forces with Nyck Caution for "Nyck at Knight"
Wanna see YFN Lucci & The T.I.G. Roster at A3C 2017? Kirk Knight's Performance Style Gets The Crowd Live! NEW MUSIC: A-Trak ft. Quavo & Lil' Yachty, "Believe"
Could Wifisfuneral Be Hip-Hop's Resurrection? Congrats to Our A3C Alumni on Making the 2017 XXL Freshman Class! Which conference track are you on? Monday Night Brewing Partners with Nappy Roots to Release New Craft Beer "Front Porch Pale Ale"
Have an idea for an A3C panel? Want to help book the A3C Festival line-up? Want to be a 2017 Speaker or Mentor? 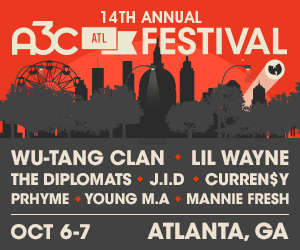 Which A3C Pass is right for you? Our Talk with Too $hort: "Oakland is a Little A** City With a Whole Lot of Pride"
DJs vs Data - Who Is Really Breaking New Music in 2016? Mayor of Cape Town Patricia de Lille visits Atlanta for A3C Action pitch night! Who’s got the Major Keys to Mental Health in Hip-Hop? Pat Stay:"Battle Rap is like mixing UFC Fighting with a Comedy Roast"
Get Booked: Four Common Artist Booking Questions. A3C Navigation: Tech Junkies Unite! Sy Ari Da Kid knows a thing or two about "Priorities"
Masculinity In Hip-Hop: How Artists Are Reshaping Our Concept of "Manhood"
Get Paid: 4 Key Income Streams For Artists. Exclusive: DJ Bhrama Bull says, "Gryndfest's name just signifies the next up"
Join Ashley Vance at the A3C Bloggers Meet-up! Hot Topics: Can a co-sign really help your rap career? Music & Money: What to Invest In & What to Avoid! Record Deal 101: The Types of Deals and What They Mean. What is the real hold up on the Carter V? Could Drake survive a battle with Eminem? HipHopDX will be Facebook Live Streaming SLAM TRUMP! Calling all A3C fans: What are you favorite festival memories? Podcast & Chill: Who's station are you rockin with? The Aphilliates: Why Millennial Dj's should "Take Notes"
Is gangster rap resurfacing after a 2-decade hiatus? SLAM TRUMP! Trump vs. MCs. Let's Make America Hip-Hop Again! "Murder was the case"-What happened during Snoop Dogg’s trial? Do the Migos get the credit they deserve? Ghostwriting 101: "Whose Line Is It Anyway?" Will Recording At Live Events Be Banned in the Future? 5 Hip-Hop Tactics That Need to Go. A3C Poll Results: Which of these artists would make the best collaboration? Why we are still pondering on Desiigner's BET performance? Has ASAP Rocky left the Hip-Hop industry for good? Why Your Song Pitch Isn't Getting Any Replies. DJs vs. Data: Who is Making Your Playlist?